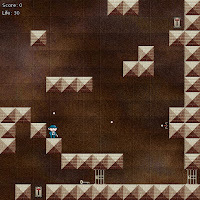 Which Way is Up is a traditional and challenging 2D platformer with a slight rotational twist. Help a mysterious big-eared salaryman named Guy find his keys in a labyrinth of dangers and bad dialogue. Use the Z or up arrow key to jump, and press the down arrow key to activate switches or collect items. Six levels in total. The Windows binary version contains an executable which runs just fine without the need for a Python installation.